I have a list (contains hundreds of items) which I need to send email notification for each item's creator on every end of quarter. Is SharePoint workflow able to loop through the list and triggered on a specific date every year? I'm not the admin of sharepoint, I'm just a sharepoint site admin. Is there a way for me to do this? Hopefully someone have any solution/suggestions. Thanks in advanced. 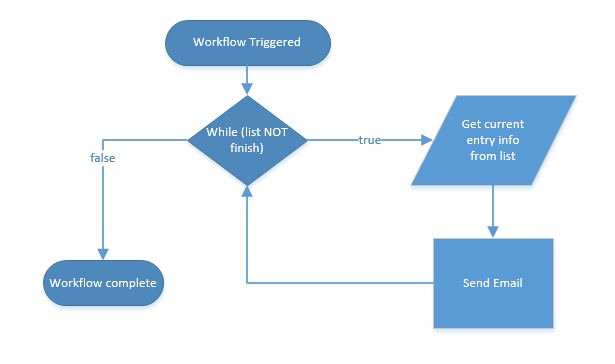 With sharepoint workflow, it is not possible. You can create a timer job using client object model in C# (CSOM). Not the answer you're looking for? Browse other questions tagged workflow loop or ask your own question. Creating a dynamic list workflow? Can SharePoint Workflow be triggered by date? how to create reminder email for yearly recurring events in SharePoint 2013 calendar?